Submitted to Enough 14. Written by David Van Deusen (District Vice President of the Vermont AFL-CIO). During the Easter Rising of 1916 Connolly’s Irish Citizen Army collaborated with fellow armed groups such as the Irish Republican Brotherhood, Irish Volunteers, & Cumann na mBan. When the first shot of the revolt was fired, it was Connelly who command all armed groups in Dublin. 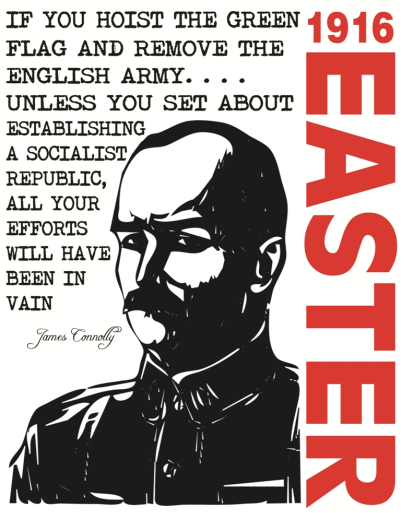 Connolly and the Irish rebels were able to hold parts of the capital for six long and bloody days against massively superior British forces. During the fighting Connolly was seriously wounded. Soon after, he and other leaders of the Rising were executed via a British Army firing squad. Next post: #Antifa #Finland: The Antifascist network Varis turns 5 years!